French architect and theorist Viollet-le-Duc (1814-1879) spent more than half of his career restoring Gothic-era castles, cathedrals, and public buildings, including such notable projects as Notre Dame de Paris and the city walls of Carcassonne. Yet he’s often seen as a pre-modernist, influencing Henry van de Velde and even Frank Lloyd Wright. Viollet-le-Duc’s theories of honest structural integrity and creative interpretation over exact replication made him a controversial figure. Leaving out certain elements of original ornamentation that he saw as nonessential changed the face of many historic buildings but the use of new innovative materials ensured their longevity. Though less romantic than fellow Gothic revivalist John Ruskin, Viollet-le-Duc’s Dictionnaire raisonné de l’architecture française (The Reasoned Dictionary of French Architecture) can easily be compared with the English critic’s Seven Lamps of Architecture as a thorough set of principles for virtuous architecture, craft, and decoration. This design for a frieze and overarch wall painting depicts heraldic emblems of Anne of Brittany (1477-1514), a strong, learned female figure of the late-Gothic and early Renaissance era. She maintained rule over an independent Brittany until her death, but also managed an accord with France through her marriage to King Louis XII. Both designs would have been used as propaganda. The combination of Breton ermine print patterns and fleur-de-lys motifs solidify her symbolic role as a reine d’alliance (queen of unity). An inscription suggests that these two designs were intended for the Palais de Justice (municipal court) in Rouen, Normandy (1832) but as an early study drawing. Some Viollet-le-Duc experts suggest that it might have been used towards the end of his career for the Chateau d’Eu (1870s). The use of such symbolism falls in line with the French architect’s theory that ornamentation functions to further explain the craft of conception, local vernacular styles, or the period being considered. However, the question remains: why would he have employed Anne of Brittany as a reconciliatory figure in a nineteenth century context, when she was again viewed as a separatist? 1 Paul Lacroix, Louis XII et Anne de Bretagne, (Paris: Geroges Hurtel, Artiste-Éditeur, 1882), 609. 2 Bruno Donzet and Christian Siret, Viollet-le-Duc, (Paris Galeries nationale du Grand Palais; Édition de la Réunion des musées nationaux; 1980), 35. 3 “OTL# 4433, David and Constance Yates,” Gail S. Davidson to Marilyn Symmes. November 19, 1998, Cooper Hewitt National Design Museum, New York, NY. 4 Eugène-Emmanuel Viollet-le-Duc and M. F. Hearn, The Architectural Theory of Viollet-le-Duc: Readings and Commentary (Cambridge, MA: MIT Press, 1990), 206. ← Would You Like a Drink with the Vacation? 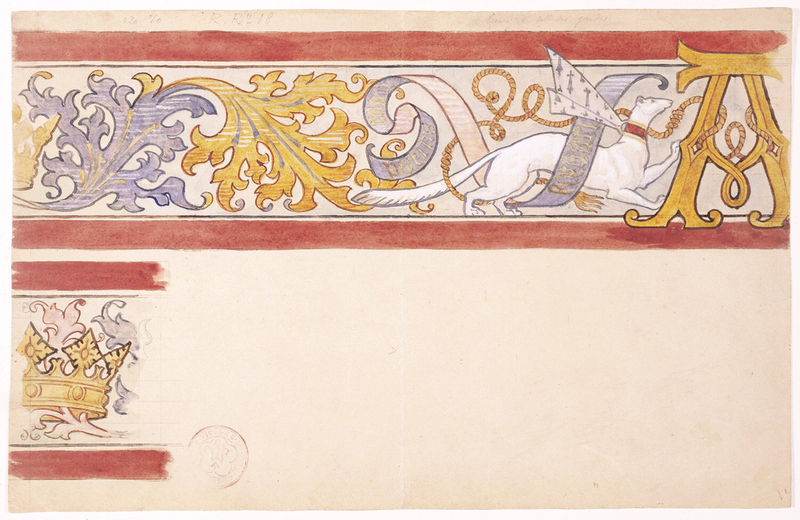 Drawing, Design for a Frieze Decoration with Ermine and Monogram of Anne of Brittany (recto); Design for a Wall Decoration with Coat of Arms of Anne of Brittany (verso), 1830–60. brush and watercolor, graphite, white gouache, black wash on heavy dark-cream wove paper, partially squared in graphite. Museum purchase from Drawings and Prints Council Fund through gift of Nancy and Edwin Marks. 1998-51-1.